It had been a few years since I had seen the Soup. The last time was when they played Download I believe, because, for some reason I cannot remember, I couldn't get to see them when they last toured here. That is too long, but all good things are worth waiting for. The place was rammed so it looked like being a good night. First up was Army Of Freshmen. It's also a couple of years since I last saw them and I had forgotten how crazy vocalist Chris Jay was as he ran around like a madman. He never stood still and tired you out just watching him, but they have always been a high energy band and damn good at what they do. 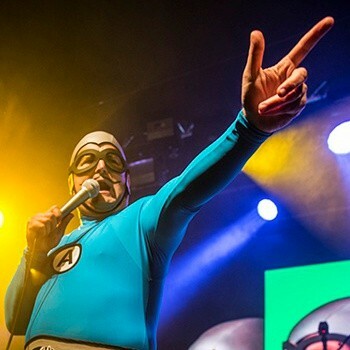 I had never even heard of the Aquabats before today and then I find out that they have their own television programme. I wasn't expecting what arrived on stage either. It is one of those things that, when you see it, you stand there asking yourself if you are actually seeing it. Naturally, I didn't know any of their music, but they were obviously going to be something to see, judging by their costumes. Yes, visually they were a blink and you will miss it band with people dressed as a boxer, cats, hammerhead sharks and a "Derby Monk" (you had to be there). There were also inflatable sharks, burger rings, beach balls and pizza slices. 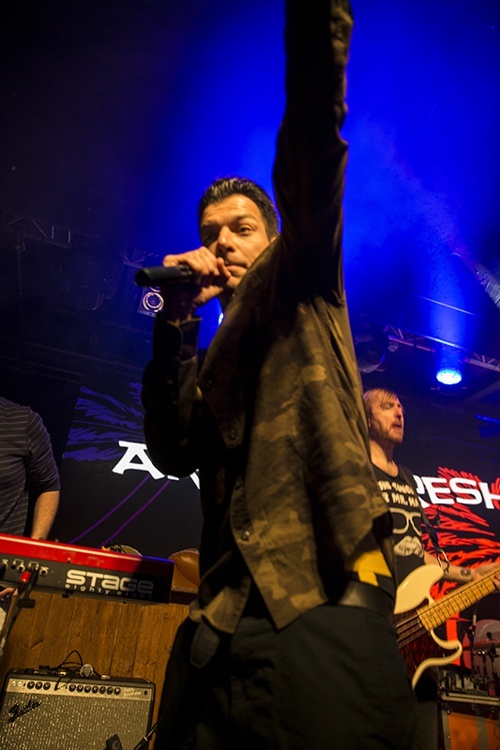 At one point, vocalist The MC Bat (Christian Jacobs) called a young fan on stage, lifted her up, threw her on to one such pizza slice which was crowd surfing and which continued in that manner with her on top. Not something you see every day! I was rather surprised when they broke into 'Tom Sawyer' during 'Pool Party.' 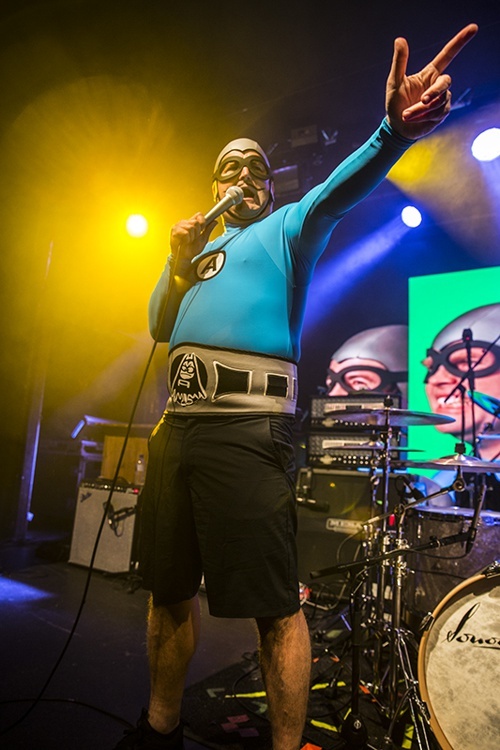 The Aquabats were definitely a band not easily forgotten once seen. It was then on to the Soup who are regular visitors to Rock City while touring these shores. As popular as ever, they had jammed the place solid and the promise was that they were going to play all of the 'Drunk Enough To Dance' album. Right from the start, there was the feeling that this would be a good night with both crowd and band being up for it. 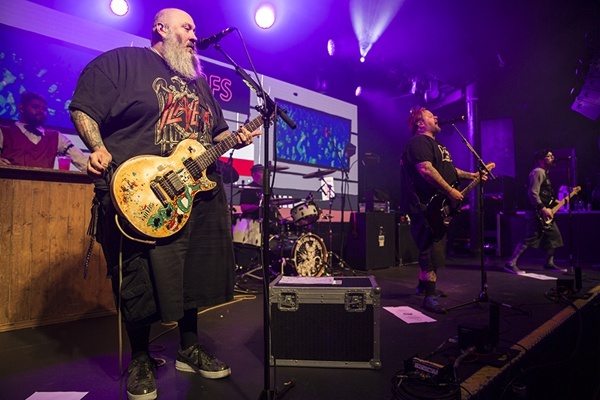 This was well illustrated during 'Girl All The Bad Guys Want', which was the third song of the night, when Jaret Reddick sang "moped" once, and the audience carried on, which prompted him to state that this was the only crowd that had done that on this tour. 'Almost' was also sung by the crowd all the way through, while 'Where To Begin' saw the band joined on stage by James (?) and his cello. Streamlining things, the band had brought their own bar, and barman Marco, situated on the rear left of the stage to replenish their beverages during the show; he happily sang along to many of the songs. Don't rule out him being made a full and essential member of the band before very long. We saw a mosh pit form for 'High School Never Ends', before Erik Chandler, after struggling for a couple of songs, finally gave up with his amplifier and swapped it for "one that worked", although it sounded fine out front. He then proceeded to play the "best bass solo ever" of five totally unrelated notes. 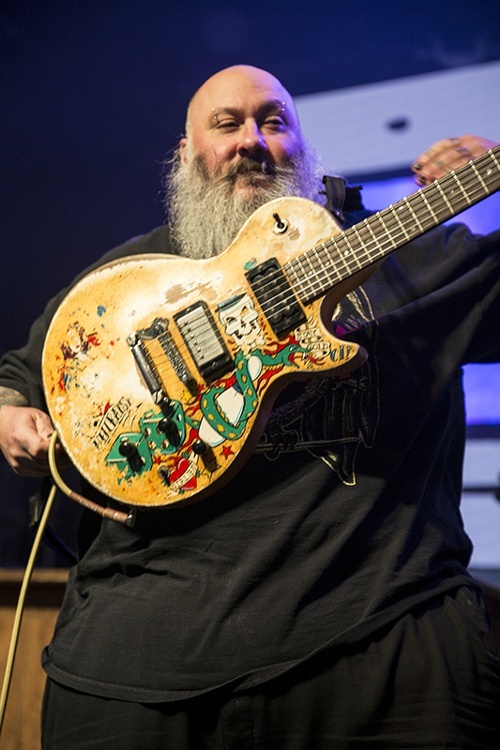 At the end of the main set, Chandler left the stage, while Reddick, Chris Burney and Gary Wiseman went to the bar as there was "no point in going off to come back for the encore, unless you need a pee". They then did 'Ohio', where the whole audience sang along, before the night finished with '1985' which had a countdown on a screen, from halfway through the set, and once again, everybody joined in. A good night was had by all, even if it was a bit weird in parts. 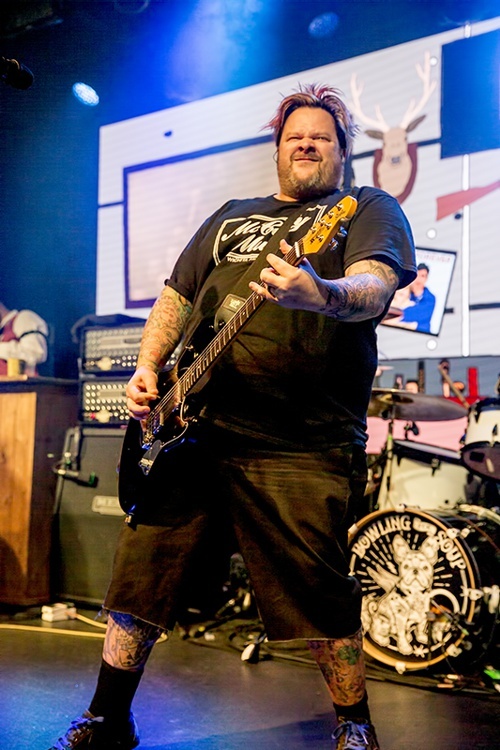 I have to say that it is the best I have seen Bowling For Soup for some time and the short break they had a couple of years ago has obviously reinvigorated them, which means music will be fun for a few more years yet.